Lightly grease the bottom and sides of the slow cooker. Pour frozen corn into the bottom of the slow cooker and place the frozen chicken breasts on top. Cover with beans and salsa. Cover slow cooker and cook on low for 6 hours. Remove chicken from slow cooker and shred with forks. 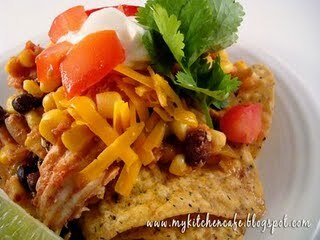 Return to the slow cooker and stir until the chicken, corn, beans and salsa are combined. Serve on a bed of tortilla chips and top with additional garnishes: lettuce, tomato, avocado, sour cream, cheese, cilantro, lime wedges, etc.